Our Land Rovers can go anywhere in Africa. Our groups usually leave the States in the early evening on an overnight flight to Amsterdam. We have an early morning rendezvous in the coffee shop at Schiphol International Airport, then down to Kilimanjaro International Airport in Arusha, Tanzania. Arrival is late evening - time for a lovely light dinner at the Lodge and a good night's sleep. 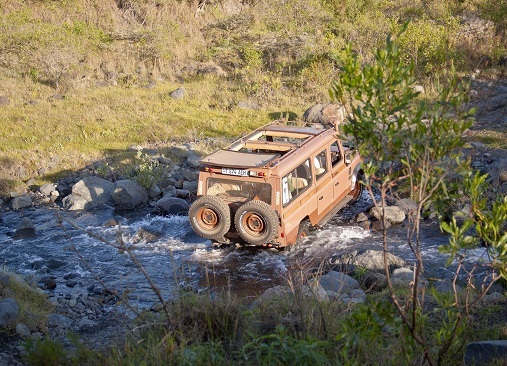 Your travel in Tanzania will be by expedition equipped Land Rover Defender 4X4’s, guide owned, maintained and driven. These Rovers are the tough workhorses of African travel. We can be adventurous, go off the beaten path, cross the rivers, follow a cheetah on the hunt, head out into the woodlands, always go for what's beyond ~ where other vehicles will not and dare not go. Comfortable seats, clear views, standing up through the roof hatch, and ample space for photography make for a great African Safari. Hang on for the ride of your life.